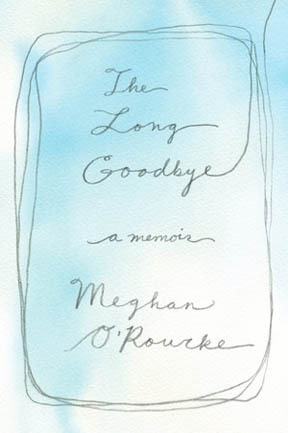 Meghan O’Rourke’s honest, artful memoir of a death and grief. When we are learning the world, we know things we cannot say how we know. When we are relearning the world in the aftermath of a loss, we feel things we had almost forgotten, old things, beneath the seat of reason. . . .
[R]esearchers now think that some people are inherently primed to accept their own death with “integrity” (their word, not mine), while others are primed for “despair.” Most of us, though, are somewhere in the middle, and one question researchers are now focusing on is: How might more of those in the middle learn to accept their deaths? Although both her parents, ex-Catholics, were atheists, O’Rourke nonetheless grew up with “an intuition of God.” After her mother’s death, she yearns for mourning rituals and for the ancient recognition of grief she senses might linger in a church community. Her friends and coworkers scarcely know how to speak with her. O’Rourke conveys her loneliness and, more surprising to her, how lost she felt. “What is grief?” she wonders. This sends her into literature and out to interview experts. She learns that almost 90 percent of people experience “normal” grief, as she did, while “complicated” grief may require therapy. The book includes five pages of recommended reading. For O’Rourke, two texts became touchstones. Shakespeare’s Hamlet, often seen as being about a young man’s dithering over contingency, reveals itself as a portrait of his devastating grief. Another key book was C.S. Lewis’s memoir A Grief Observed. The Long Goodbye is that rare book that made me think, soon after starting it, I want to read this again. O’Rourke has a sure sense of sentences, from simple declarations to lyrical descriptions, often with arresting turns of phrase. As Barbara actively dies that last Christmas, she makes “a madrigal of quiet sounds, as if to indicate that she was with us.” As well, O’Rourke tunes her sentences’ and passages’ collective rhythms. The book’s three-part structuring of its diverse content guides the reader. This story of personal loss becomes a window into death’s universal magnitude. Sounds like a book that needs to be on my list. It’s well worth reading, Shirley. Or having on the list when when a book on loss and grief is called for. Hi, Richard. I lost my father when I was 11 1/2, and there are times when I’m still dealing with what I might call “submerged content,” things I don’t know even what to think about. I didn’t grieve the way people thought I should at the time, with tears and so on and so forth, and maybe they were right about that, I don’t know. But even though I’ve thought many times that my father would not have been able to condone or appreciate the sense of equality I needed as I grew up, and wouldn’t have tolerated feminism, I still think a part of me is mourning what we DID have. My mother is still living and is in very good health and fine fettle, and though I know people say “comparisons are odious,” I can’t imagine what losing her will be like, so much deeper in some ways, or perhaps more puzzling and bewildering than losing my father, because she and I have had our ups and downs, but she’s always been my cheering section and good friend. She and I have lived together in the recent past, and now she is at my brother’s a lot of the time in another state, and though we talk several times a day on the phone, I am prone to waking up in the middle of the night and feeling scared and anxious that she isn’t there in the next room, or waking up when she is there and feeling reassured. In general, I am not timid about being alone, so this is a very odd development of her independence. All of this is just to say, I understand what your author is talking about with mothers, that sense that they cannot be adjudged or calculated upon in the manner of other people. There is some mysterious link beyond the physical and mental, even beyond the spiritual, that makes mothers and children what they are in relation to each other, and which affects us, I think, when we no longer have them around, whether we lose them to time or space, in a permanent or even sometimes in a temporary way. Them’s my thoughts, anyway. Sorry to be so lengthy. Thank you, Victoria. It seems to me that O’Rourke wrote her book for the very reasons you touch on. The ongoing sense of loss if not grief, and the knowledge that that’s part of being human. It’s a profound subject indeed.